From Baltimore Maryland, Cris Alex had always had a passion for the arts. Perhaps this love for the general arts coupled with her attention to detail and unlimited imagination explains how she is able to bend the rules of traditional applications of makeup artistry to create a style and look of her own. 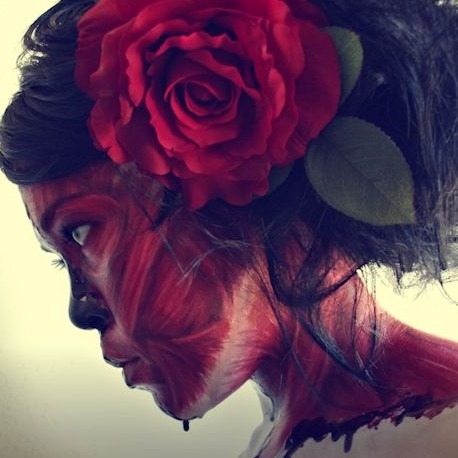 Following her education in the field, Cris moved to Los Angeles in 2008 to pursue her career in special makeup effects. Here, working for numerous FX shops she has added such projects as: Tron: Legacy, Amazing Spiderman 2, X-Men Days of Future Past, Sleepy Hollow (the TV series) and Excision to her credits. In addition, Cris was assistant to Celebrity Makeup Artist Maxi on the Alicia Keys music video “Tears Always Win” and was awarded RAWartist 2012 national title for “Makeup Artist of the Year”. As she continues to intrigue and captivate her fans with her unique style, the work of Cris Alex will go on to grace numerous productions, publications and websites. Directed by Richard Bates Jr.